So we are in Dallas and this morning I decided to take my run through my old neighborhood and down to the elementary school that I attended. I didn’t have many expectations for this run and my primary goal for this run was just to enjoy myself. The only other goal I had was not to get lost. I used my Garmin 405 to run with this morning. I love this tool. It is great to be able to strap it on my arm, put on my chest strap and go. 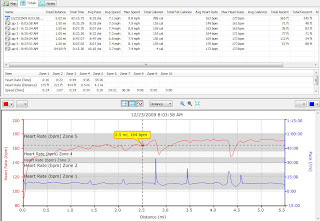 You notice the interface is different from the Training Peaks WKO+ software. I don’t love the Garmin Training Center software and I don’t hate it. It is what it is. I wish it did a better job in tracking power, but how accurate would that be? From my numbers, I burned 788 calories on the run. To determine kJ, you use the multiplier 4.184, which means I generated 3,297 kJ on this run. I am not sure how accurate that is. I think the calorie calculation is, but I find it tough to believe that I create that many more kJ running than biking. Does anyone else have a more accurate way? Am I stuck with calories? Nice run today. I always wonder if the calories are accurate on the Garmin. They seem somewhat realistic on the 405 but absolutely ridiculous on the 705. You'll see training reports on my blog, though I tend to focus more on the experience and things I want to remember in 10 years than the blow by blow, but I keep a training log on Beginner Triathlete for that. I DO love my Garmin too. I just hardly ever download my data, is that wrong?